DESERTED was inspired by photography Avis saw five years ago. She was on set and her DP approached her with photographs he had shot over the weekend. The photos of Death Valley struck a chord with Avis. She described them as "endless stretches of beauty and nothingness." She didn't immediately have the story, but she knew she wanted to tell one there. The film she developed is the story of being hopelessly lost in a place that is equally beautiful and dangerous. When Jae (Mischa Barton) is released from jail she returns to her former small-town home in California. Rural America often trades in gossip and judgement. With both subtle and at times downright obvious prejudice following her everywhere, she is looking for any excuse to get out of town. When she hears her brother Robin (Jackson Davis) and his girlfriend (Winter Ave Zoli) are heading north to attend the BURN THE MOON festival in Death Valley, she knows she will find a way to attend. A group of young adults heading off to the desert to see a concert in one of the hottest places on earth that happens to be notorious for its confusing trails and isolation... what could go wrong? The film is both stunning and unnerving much like the desert it takes place in. Honestly, the visuals are so appealing in this film it could have passed with even bad acting and sloppy writing. Fortunately, DESERTED isn't weighed down by either. The script is tight and the acting is natural. We are allowed to spend time with each of the characters and grow increasingly fond of them as the narrative reveals itself. While you might have an idea where the story is headed the performances and scenery are so engaging it doesn't matter. Fans of Gilmore Girls and 80's hair metal will be pleasantly surprised by one of the films cameos. Overall its clear that DESERTED was a passion project for Avis. While the film was shot in 17 days on a limited budget, the setting and casting elevate the project. It stands shoulder to shoulder with any wide release I've seen in the past year. While I don't know the particulars, shooting in this location on such a tight schedule must have presented its fair share of challenges. Avis was able to work against the odds and create one hell of a little film. Deserted is currently available on FlixFling, Amazon, iTunes, Dish Network, Time Warner, DirecTV, XFinity, Verizon FiOS and more. 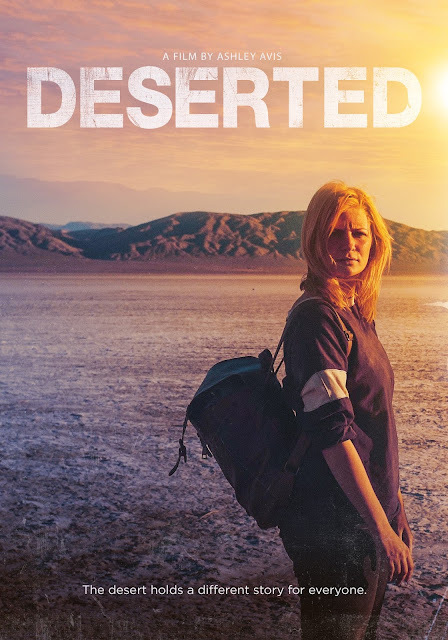 Deserted Trailer from Invincible Entertainment on Vimeo.